We are flirting with catastrophe, and our foreign creditors are part of the story. Washington can act with breathtaking urgency when the right people want something done. In this case, the people are Wall Street’s titans, who are scared witless at the prospect of their historic implosion. Congress quickly agreed to enact a gargantuan bailout, with more to come, to calm the anxieties and halt the deflation of Wall Street giants. Put aside partisan bickering, no time for hearings, no need to think through the deeper implications. We haven’t seen “bipartisan cooperation” like this since Washington decided to invade Iraq. In their haste to do anything the financial guys seem to want, Congress and the lame-duck President are, I fear, sowing far more profound troubles for the country. First, while throwing our money at Wall Street, government is neglecting the grave risk of a deeper catastrophe for the real economy of producers and consumers. Second, Washington’s selective generosity for influential financial losers is deforming democracy and opening the path to an awesomely powerful corporate state. Third, the rescue has not succeeded, not yet. Banking faces huge losses ahead, and informed insiders assume a far larger federal bailout will be needed–after the election. No one wants to upset voters by talking about it now. The next President, once in office, can break the bad news. It’s not only about the money–with debate silenced, a dangerous line has been crossed. Hundreds of billions in open-ended relief has been delivered to the largest and most powerful mega-banks and investment firms, while government offers only weak gestures of sympathy for struggling producers, workers and consumers. The bailouts are rewarding the very people and institutions whose reckless behavior caused this financial mess. Yet government demands nothing from them in return–like new rules for prudent behavior and explicit obligations to serve the national interest. 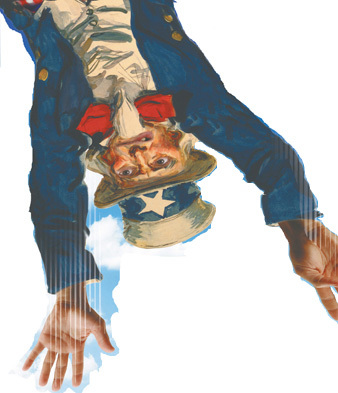 Washington ought to compel the financial players to rein in their appetite for profit in order to help save the country from a far worse fate: a depressed economy that cannot regain its normal energies. Instead, the Federal Reserve, the Treasury, the Democratic Congress and of course the Republicans meekly defer to the wise men of high finance, who no longer seem so all-knowing. Let’s review the bidding to date. After panic swept through the global financial community this spring, the Federal Reserve and Treasury rushed in to arrange a sweetheart rescue for Bear Stearns, expending $29 billion to take over the brokerage’s ruined assets so JPMorgan Chase, the prestigious banking conglomerate, would agree to buy what was left. At the same time, the Fed and Treasury provided a series of emergency loans and liquidity for endangered investment firms and major banks. Investors were not persuaded. Their panic was not “mental,” as former McCain adviser Phil Gramm recently complained. The collapse of the housing bubble had revealed the deep rot and duplicity within the financial system. When investors tried to sell off huge portfolios of spoiled financial assets like mortgage bonds, nobody would buy them. In fact, no one can yet say how much these once esteemed “safe” investments are really worth. The big banks and investment houses are also stuck with lots of bad paper, and some have dumped it on their unwitting customers. The largest banks and brokerages have already lost enormously, but lending portfolios must shrink a lot more–at least $1 trillion, some estimate. So wary shareholders are naturally dumping financial-sector stocks. Most recently, the investors’ fears were turned on Fannie Mae and Freddie Mac, the huge quasi-private corporations that package and circulate trillions in debt securities with implicit federal backing. Treasury Secretary Henry Paulson (formerly of Goldman Sachs) boldly proposed a $300 billion commitment to buy up Fannie Mae stock and save the plunging share price–that is, save the shareholders from their mistakes. So much for market discipline. For everyone else, Washington recommends a cold shower. Talk about warped priorities! The government puts up $29 billion as a “sweetener” for JP Morgan but can only come up with $4 billion for Cleveland, Detroit and other urban ruins. Even the mortgage-relief bill is a tepid gesture. It basically asks, but does not compel, the bankers to act kindlier toward millions of defaulting families. A generation of conservative propaganda, arguing that markets make wiser decisions than government, has been destroyed by these events. The interventions amount to socialism, American style, in which the government decides which private enterprises are “too big to fail.” Trouble is, it was the government itself that created most of these mastodons–including the all-purpose banking conglomerates. The mega-banks arose in the 1990s, when a Democratic President and Republican Congress repealed the New Deal-era Glass-Steagall Act, which prevented commercial banks from blending their business with investment banking. That combination was the source of incestuous self-dealing and fraudulent stock valuations that led directly to the Crash of 1929 and the Great Depression that followed. Even before Congress and Bill Clinton repealed the law, the Federal Reserve had aggressively cleared the way by unilaterally authorizing Citigroup to cross the line. Wall Street proceeded, with accounting tricks described as “modernization,” to re-create the same scandals from the 1920s in more sophisticated fashion. The financial crisis began when these gimmicky innovations blew up. Democrats who imagine they can reap partisan advantage from this crisis don’t know the history. The blame is bipartisan; so also is the disgrace. In 1980, before Ronald Reagan even came to town, Democrats deregulated the financial system by repealing federal interest-rate ceilings and other regulatory restraints–a step that doomed the savings and loan industry and eliminated a major competitor for the bankers. Democrats have collaborated with Republicans on behalf of their financial patrons every step of the way. The same legislation also repealed the federal law prohibiting usury–the predatory practices that ruin debtors of modest means by lending on terms that ensure borrowers will fail. Usurious lending is now commonplace in America, from credit cards and “payday loans” to the notorious subprime mortgages. The prohibition on usury really involves an ancient moral principle, one common to Judaism, Christianity and Islam: people of great wealth must not be allowed to use it to ruin others who lack the same advantages. A decent society cannot endure it. The fast-acting politicians may hope to cover over their past mistakes before the public figures out what’s happening (that is, who is screwing whom). But the Federal Reserve has a similar reason to move aggressively: the Fed was a central architect and agitator in creating the circumstances that led to the collapse in Wall Street’s financial worth. The central bank tipped its monetary policy hard in one direction–favoring capital over labor, creditors over debtors, finance over the real economy–and held it there for roughly twenty-five years. On one side, it targeted wages and restrained economic growth to make sure workers could not bargain for higher compensation in slack labor markets. On the other side, it stripped away or refused to enforce prudential regulations that restrained the excesses of banking and finance. In The Nation a few years back, I referred to Alan Greenspan as the “one-eyed chairman” [September 19, 2005] who could see inflation in the real economy–even when it didn’t exist–but was blind to the roaring inflation in the financial system. The Fed’s lopsided focus on behalf of the monied interests, combined with its refusal to apply regulatory laws with due diligence, eventually destabilized the overall economy. Trying to correct for previous errors, the Fed, with its overzealous free-market ideology, swung monetary policy back and forth to extremes, first tightening credit without good reason, then rapidly cutting interest rates to nearly zero. This erratic behavior encouraged a series of financial bubbles in interest-sensitive assets–first the stock market, during the late 1990s tech-stock boom, then housing–but the Fed declined to do anything or even admit the bubbles existed. The nation is now stuck with the consequences of its blindness. The Federal Reserve’s dereliction of duty is central to the financial failures. It betrayed the purpose for which the central bank was first created, in 1913, abandoning the sense of balance the Fed had long pursued and that Congress requires. Most politicians, not to mention the press, are too intimidated to question the Fed’s daunting power, but their ignorance is about to compound the problem. Instead of demanding answers, the political system is about to expand the Fed’s governing powers–despite its failure to protect us. Treasury Secretary Paulson proposed and Democratic leaders have agreed to make the insulated Fed the “supercop” that oversees not only commercial banks and banking conglomerates but also the largest investment houses or anyone else big enough to destabilize the system. This “reform” would definitely reassure club members who are already too cozy with the central bankers. Everyone else would be left deeper in the dark. The political system, once again, is rewarding failure. The Fed is an unreliable watchdog, ideologically biased and compromised by its conflicting obligations. Is it supposed to discipline the big money players or keep them afloat? Putting the secretive central bank in charge, with its unlimited powers to prop up troubled firms, would further eviscerate democracy, not to mention economic justice. If Congress enacts this concept early next year, the privileged group of protected financial interests is sure to grow larger, because other nonfinancial firms could devise ways to reconfigure themselves so they too would qualify for club membership. A very large manufacturing conglomerate–General Electric, for instance–might absorb elements of banking in order to be covered by the Fed’s umbrella (GE Capital is already among the largest pools of investment capital). Private-equity firms, with their buccaneer style of corporate management, are already trying to buy into banking, with encouragement from the Fed (the Service Employees International Union has mounted a campaign to stop them). A new President could stop the whole deal, of course, but John McCain has surrounded himself with influential advisers who were co-architects of this financial disaster. For that matter, so has Barack Obama. The nation, meanwhile, is flirting with historic catastrophe. Nobody yet knows how bad it is, but the peril is vastly larger than previous episodes, like the savings and loan bailout of the late 1980s. The dangers are compounded by the fact that the United States is now utterly dependent on foreign creditors–Japan and China lead the list–who have been propping us up with their lending. Thanks to growing trade deficits and debt, foreign portfolio holdings of US long-term debt securities have more than doubled since 1994, from 7.9 percent to 18.8 percent as of June 2007. If these countries get fed up with their losses and pull the plug, the US economy will be a long, long time coming back. The gravest danger is that the national economy will weaken further and spiral downward into a negative cycle that feeds on itself: as conditions darken, people hunker down and wait for the storm to pass–consumers stop buying, banks stop lending, producing companies cut their workforces. That feeds more defaulted loan losses back into the banking system’s balance sheets. This vicious cycle is essentially what led to the Great Depression after the stock market crash of 1929. I offer not a prediction but a warning. The comparison may sound farfetched now, but US policy-makers and politicians are putting us at risk of historic deflationary forces that, once they take hold, are very difficult to reverse. A more aggressive response from Washington would address the real economy’s troubles as seriously as it does Wall Street’s. Financial firms have lost capital on a huge scale–more of them will fail or be bought by foreign investors. But Wall Street cannot get well this time if the economy remains stuck in the ditch. Washington needs to revive the “animal spirits” of the nation at large. The $152 billion stimulus package enacted so far is piddling and ought to be three or four times larger. Instead of sending the money to Iraq, we should be spending it here on getting people back to work, building and repairing our tattered infrastructure, investing in worthwhile projects that can help stimulate the economy in rough weather. § Nationalize Fannie Mae and other government-supported enterprises instead of coddling them. Restore them to their original status as nonprofit federal agencies that provide a valuable service to housing and other markets. Make the investors eat their losses. Buy the shares at 2 cents on the dollar. Without a federal guarantee, these firms are doomed anyway. § Resolve the democratic contradiction of “too big to fail” bailouts by dismantling the firms that are too big to fail–especially the newly created banking conglomerates that have done so much harm. Restore the boundaries between commercial banking and investment banking. In any case, market pressures are likely to shrink those behemoths as banks sell off their parts to survive. For the remaining big boys, revive antitrust enforcement. Set stern new conditions for emergency lending from government–supervised receivership, stricter lending rules to prevent recidivism and severe penalties for greed-crazed shareholders and executives. § Assign the Federal Reserve’s regulatory role to a new public agency that is visible and politically accountable. Make the Fed a subsidiary agency of the Treasury Department and reform its decision-making on money and credit to restore an equitable balance between competing goals and interests–seeking full employment but also stable money and moderate inflation. § Begin the hard task of re-creating a regulated financial system Americans can trust, one that recognizes its obligations to the broad national interest. This requires regulatory reforms to cover moneypots like private-equity funds and to clear away the blatant conflicts of interest and double-dealing on Wall Street, and also to give responsible shareholders, workers and other interests a greater voice in corporate management and greater protection against rip-offs of personal savings. § Re-enact the federal law against usury. The details are difficult and can follow later, but this would be a meaningful first step toward restoring moral obligations in the financial sector. People would understand it, and so would a lot of the money guys. Maybe in the deepening crisis, Washington will begin to grasp that money is also a moral issue.